We often hear people talk about America’s Christian heritage. Usually it is in the context of some government action or judicial decision which denies this heritage. There is no denying that our government and other forces are operating in warp speed to remove all vestiges of our Christian roots, while at the same time attempting to reclassify our Founders as other than Christians and attempting to define and rewrite our very history. And they are making tremendous headway. We saw the extent of the hostility towards our religious heritage when the delegates to Democratic Convention voted to remove the word “God” from its platform. The convention chairman, Antonio Villaraigosa, declared that the votes were sufficient to keep “God” in the platform but anyone who watched the vote knew the opponents really won the day. But those who understand the significance of our Christian heritage are fighting to keep that heritage alive. “I’m retracing the footsteps of our Founders from England to America in the hope of discovering our true “national treasure.” I want to listen to them, to learn from them. Because I suspect Forefathers knew we were a forgetful people, that someday we would lose our way as a nation. So they left us a map that would guide us back to the source of America’s success. What he found was a simple truth. Our Pilgrim and Puritan forefathers carried the secret to successful self-government with them across the Atlantic. Their greatest contribution was the notion that only a religious and moral people could be trusted to govern themselves successfully. Only a religious and moral people could be trusted with liberty. Cameron documented his journey in a movie called Monumental: In Search of America’s National Treasure. What do we mean by “Our Christian Heritage”? And as Kirk Cameron emphasizes in his movie Monumental, America was founded by settlers – Pilgrims and Puritans – who wanted to establish a new land where they could live the teachings of the gospel. But this is only the surface. Everywhere Christianity has been able to penetrate culture and society, it has been successful. It has been so successful that others, such as atheists and extremists, have flocked to Christian empires to enjoy its freedom and prosperity. The humanization that derives from Christianity has touched the heart of civilization and civilization will never be the same again. The gospel was introduced to America with the Pilgrims and the Puritans, and the timing of their voyages to America was significant. It coincided with two major events: First the Bible was translated from Latin into English in the late 16th century and then in 1610, the work went to press, becoming available in print the following year. It became known as “The King James Bible” in honor of England’s king at the time. Monumental begins with Kirk Cameron’s research into the Pilgrims and their famous voyage to the New World on the Mayflower. He traces their steps, from point to point, as they escaped from England to start a new colony, Plymouth Colony, in an unknown and uncharted new land. The story is told by Cameron, in the form of a narration and in dialogue with experts, as he goes from point to point along the Pilgrim’s escape route from England. We learn how the Pilgrims were part of the Puritan movement (a separatist movement, from the Church of England). We learn how they became spiritually aware when the printed English Bible became available. They could read the gospel of Jesus Christ firsthand and not have to wait to hear scripture read in the Church, headed by the King of England. This relatively small band of men, women, and children had a strong desire to serve God as they saw fit, free from the Church of England and the religious policies of the King. Being identified as “separatists” or “purists” made them potential traitors to the Crown and made them outcasts. In order to exercise religious freedom, they would have to leave England, settle in Holland (perhaps one of the only places they could be free from persecution) for 11 years, and eventually make their way back to England to commission a ship to take them to the New World. Monumental chronicles their trials and tribulations. We learn how God protected them and how their faith helped them endure each of the many setbacks that threatened to derail their mission. We learn that the Pilgrims and members of the crew signed a compact, the Mayflower Compact, in 1620 before departing the ship to express their desire to be rid of British law and to establish a form of self-government based on just and equal laws and for the advancement of the Christian faith. In the New World, government would be established to serve their interests and they would be masters of their government, unlike in England, where the government was the master of the people who exist to serve the interests of government. By the time the film moves on to Plymouth, Cameron has already shown the Pilgrims to be far more courageous and principled that the stoic, starched creatures in black and white clothes with buckled black shoes that we learned about in elementary school. They were devout, hard-working, family-loving, persevering people who were committed to establishing a successful colony based on self-government and religious freedom. One of the most striking parts of the movie was when Cameron visited a monument that I had never heard of – “The National Monument to the Forefathers in Plymouth, MA” (also referred to as “The Pilgrim’s Monument”). In the film, the monument is referred to as the “Matrix of Liberty.” The “Matrix of Liberty” is an enormous granite monument devoted to the principles that the Pilgrims embraced in Plymouth to order their society. The Pilgrims ordered their society on eternal truths, including faith, morality, justice, mercy, and education. In fact, the monument is structured and built to show the interdependence of these truths. The center of the monument is a giant women holding a Bible and pointing to the Heavens. She is Faith. At each of the four corners of the base of the monument is a pillar, representing Morality, Law, Education, and Liberty. The pillars have a certain order, starting with Morality and ending with Liberty. The so-called “Matrix of Liberty,” and the values and priorities it represents, is the real legacy of the Pilgrims. Not the black and white dress or suit with the shoes with the black buckle. Not the hair up in a bun with a white kerchief or the turkey feast. Yet no one celebrates this. Public schools only teach about the successful harvest, and not the successful formula for religious liberty and other fundamental liberties. The Pilgrims were British subjects looking for religious liberty, yet with the Mayflower Compact, they devised a special formula to protect all liberty. It is a magical recipe centered on the word of God and that provides a blueprint for the government of a free people and its protection. At the core of that recipe is the recognition that only a religious and moral people can be entrusted with the responsibility of securing so great a gift as Liberty. This is America’s Christian heritage. Our Christian heritage is the reason we have a government system centered around the individual, bound to protect his sovereign rights. Our Christian heritage is inextricably connected to our founding principles. [Note that the word “principle” comes from a Latin root that means “first things.”] Now that we know what this heritage is, we can see it clearly in our charter of freedom, the Declaration of Independence, and our very Constitution. Did the “Matrix of Liberty” have any influence on our Founding Fathers? The last leg of Kirk Cameron’s journey to find our “national treasure” took him to Aledo, Texas where he met with David Barton, founder of Wallbuilders. Barton has an extensive collection of original documents and books from the era of our Founding Fathers. He was able to convince Cameron, using their writings and through the very fact that Congress published thousands of Bibles for public schools to use to instruct students, that indeed, the Pilgrim’s special formula had been embraced by the Founders when they crafted our government and secured our rights. In the United States, we enjoy a representative government. “That to secure these rights, Governments are instituted among Men, deriving their just powers from the consent of the governed…” Abraham Lincoln reaffirmed that fact in the Gettysburg Address – “A nation by the people, of the people, for the people….” The Constitution is a restraint on self-government. It forms the basis of our republic, which essentially means that we have a form of government defined by laws so that complete power is never in the hands of the majority (which can become a mob). A republic respects the sovereignty of each individual, while in a democracy the majority exerts sovereign rights. In a republic, the sovereignty of the people is exercised through representatives they choose, to whom those powers are specially delegated and limited by the Constitution. For example, the Bill of Rights guarantees that no matter what the will of the majority is, they can never deny fellow Americans certain fundamental rights. Our elected government officials do not exercise force and power by divine right. The authority they possess for making laws that the average citizen is expected to obey comes ultimately from the Constitution. Without explicit authorization, they have no power. Of course it takes principled, ethical, moral, and educated individuals to give proper respect to his or her oath of office and serve the people within constitutional bounds. Our Founding Fathers were keenly aware of the limits of human reason and of the temptations of political power. History had taught them well. They drafted our Constitution with limiting language precisely because they knew that their successors would need constant reminders of the values that they believed were critical and of the foundational principles on which the government was built. The preservation of liberty depends on two things: a constitution that limits the amount of government in people’s lives and a citizenry that requires little government. We still have our Constitution to protect us from the reaches of government, although the government is slowly exceeding the power that was originally granted to it. What we don’t have is a citizenry that is disciplined enough and moral enough to require as little government as possible. When laws are too numerous, they are just as dangerous to the exercise of liberty as having no law at all. A just and enduring government depends equally on the integrity and faithful adherence to the Constitution and the morality of its people. 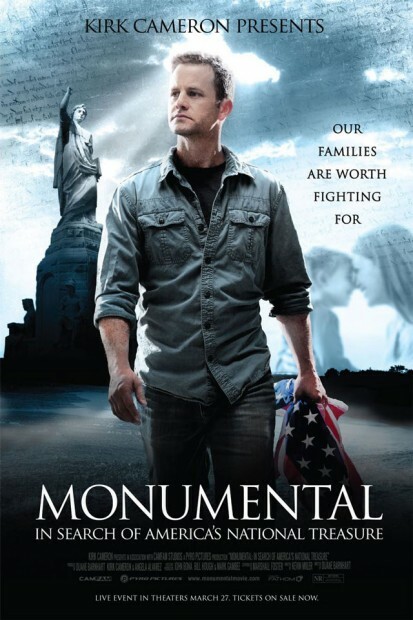 The full title of Kirk Cameron’s film is “Monumental: In Search of America’s National Treasure.” So what is America’s “national treasure”? It is its Christian heritage. It is the lasting legacy of the Pilgrims in our founding documents and on our national fabric. How does it all end? We won’t know how our republic will end because that is ultimately up to the character and commitment of the American people. But the film Monumental ends with an optimistic message….. for those who will heed it, that is. Cameron reminds us that we are in a constitutional crisis and according to many evangelicals and believers, we are on target to be destroyed in the end times because of the choices our nation has made. But he is not ready to give up on the United States. He tells us: “I still have children in this world. I want a bright future for them.” The solution, he says, lies in the Pilgrim’s statue – the “Matrix of Liberty.” The solution is a return to the values, principles, and priorities that defined the first American government established here in the New World. Unfortunately, the statue is hidden away in a small remote park, tucked among residential developments in Plymouth, Massachusetts and not displayed proudly along with the rest of our history, where everyone can see it – in Washington DC. We don’t advance our republic by ignoring our Christian heritage. We save our republic by re-embracing it. “We establish no religion in this country, nor will we ever. We command no worship. We mandate no belief. But we poison our society when we remove its theological underpinnings. We court corruption when we leave it bereft of belief. All are free to believe or not to believe; all are free to practice a faith or not. But those who believe must be free to speak of and act on their belief; to apply moral teaching to public questions.